Bixby came into ownership of the Steelmantown Cemetery by accident. A lifelong resident of the area located in Upper Township, he is a home-builder by trade. The green cemetery is more of a passion. When the former owner offered to sell Bixby the cemetery for $1 two years ago, he couldn’t pass up the opportunity. “I make my money building houses, but I actually prefer doing this,” Bixby said. And his family supports his decision. “They know why I did it. It’s a legacy I can leave them and I can help families,” he said. It’s a family legacy that dates as far back as Bixby can tell. Although the cemetery was established in the 1700s, his grandfather rebuilt the old church on the property in 1910, his family is buried here, and Bixby himself rebuilt the chapel again just two years ago when he took over the property, with all recycled materials, of course. “This burial ground has always been a green burial ground,” Bixby said. In fact, many of the settlers of Steelmantown, one of the original settlements in Cape May County, are buried here. When a Southern Baptist congregation took over the grounds, they kept with the green burial tradition. Although many believe it to be true, it is not illegal to have a burial of a human being without embalmment. The New Jersey Cemetery Board controls all the cemeteries in the state, however, cemeteries can set their own rules, so long as they stay within the confines of the board’s regulations and laws. Due to this, many require embalming for a burial. Embalming fluid became popular in the United States after the Civil War when dead soldiers were being delivered to their families and needed to be preserved for travel. Dr. Thomas Holmes of Brooklyn, N.Y., invented the solution in the mid-1800s. Embalming fluid usually contains formaldehyde, methanol, ethanol and other solvents that help to prevent decomposition, sanitize the body and keep it looking “lively” for viewings and wakes. 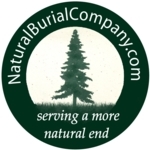 “If you saw the toxins that go in the ground from embalming fluid, it’s amazing. It’s cyanide. It’s so unbelievably dangerous,” Bixby said, adding that there are some biodegradable embalming fluids being developed today. 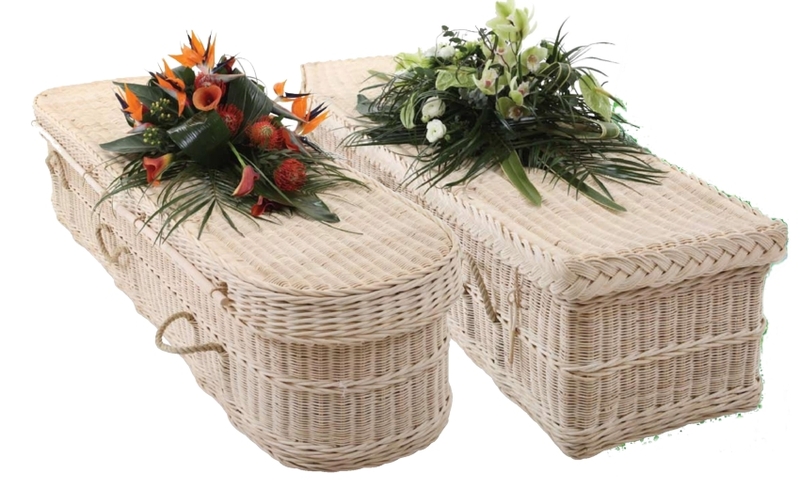 For green burials, the body is never touched with chemicals, and in most cases not ever disturbed, except for in the case of autopsies to determine the cause of death. Bodies are typically buried within 24 to 48 hours of death. However, with proper refrigeration, Bixby said he’s had burials within two weeks after a person dies. Due to this, there aren’t really viewings in these types of funerals. “Today, (embalmment is) for viewing purposes. Nobody ever looks the same when they’re lying in a coffin,” Bixby said. 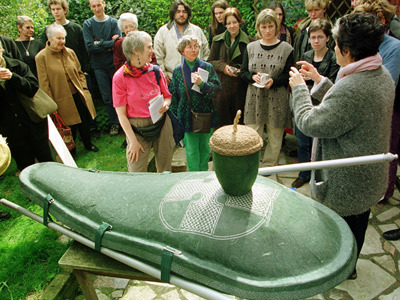 Speaking of coffins, that’s not necessary in a green funeral either. Bixby said a lot of people buried in their favorite blanket, but they can be buried in anything that is biodegradable. 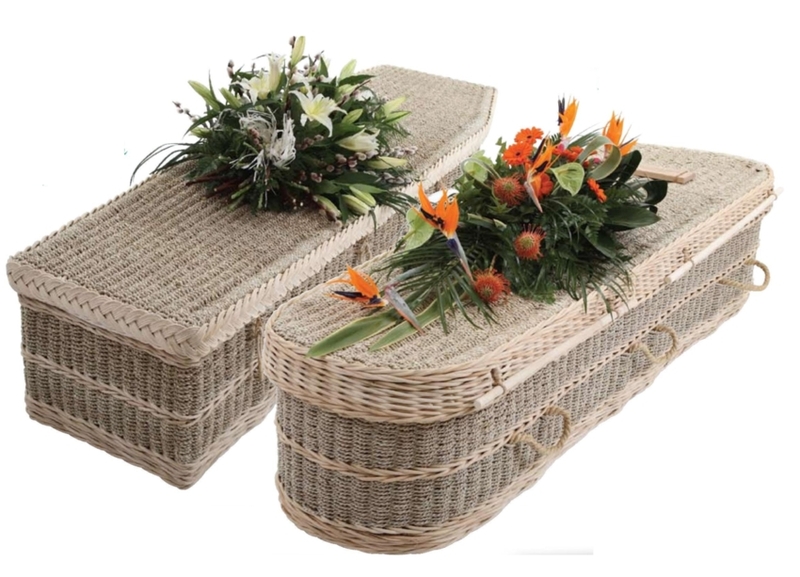 In a tiny building just along the end of one of the trails that surround the cemetery, Bixby displays a wicker casket with a cotton lining. 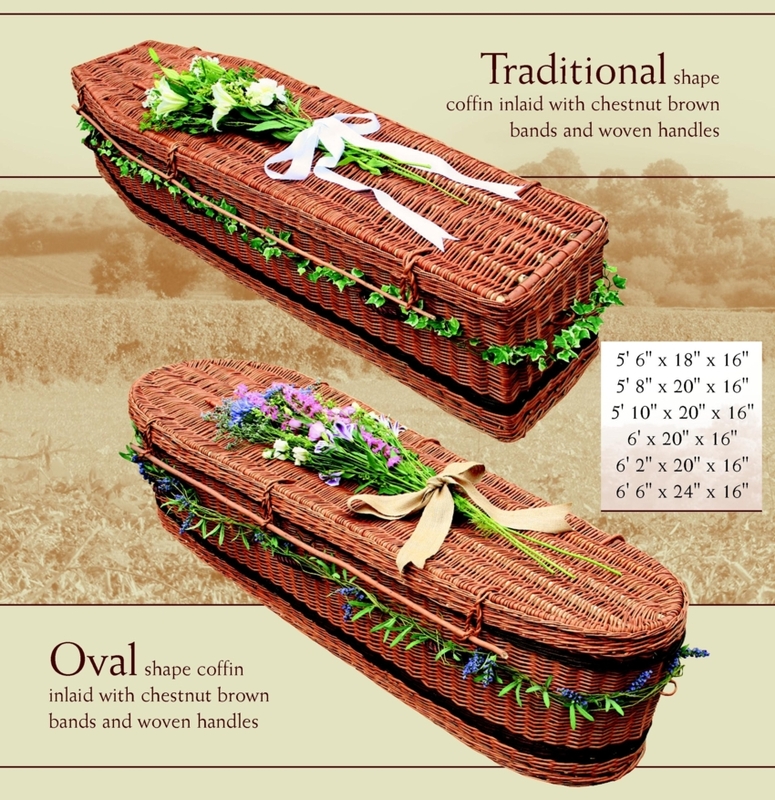 This is just one example of the many types of coffins available in a green burial. Bixby said they can be made of anything from seagrass to unfinished pine wood. Needless to say, this option is much cheaper than purchasing a traditional coffin for burial, which wouldn’t be allowed here anyway. A headstone isn’t necessary either. Headstones here must also be made of natural materials. Most are large engraved natural stones or wooden crosses. The older portion of the cemetery at Steelmantown consists of cedar planks, with the engraving all worn away, and stones. Some of the newer graves are almost unrecognizable, and not for lack of maintenance, but because they look natural to the area, which is surrounded by old cranberry bogs, a two-mile eco-trail and the Belleplain State Forest. Graves at Steelmantown Cemetery are hand-dug, five feet deep, and nothing that comes out of the ground doesn’t go back in, Bixby said. “Essentially, every part taken out is put back in the way it came out,” he said. This technique is especially important for off-trail burials. Of all the burial plots on the nine-acre cemetery, only one person is buried off-trail. This is an extremely personal and green way to go, Bixby said. While the brush that covers the land is removed to dig the grave, it is all replaced once the burial is complete, leaving the land virtually unmarked for future visits. All the plots in the Steelmantown Cemetery are deeded once they are sold. Those off-trail sites have GPS coordinates that make visiting a loved-one an easy task. There are cemeteries that are not certified green, but that allow for green burials. “People who want green burials, but a traditional cemetery is fine for them are completely different than people who are buried here,” Bixby said. He said that for those that want a green certified burial ground, traveling is never a burden. Before Steelmantown became certified, the two closest green certified cemeteries for New Yorkers, which make up 90 percent of Bixby’s clientele, were Ramsey Creek, S.C., and Ithaca, N.Y.
“It’s crazy to think that people would travel, but it’s because it’s such a special place,” Bixby said. “I didn’t realize how special it was. “This is a final statement in their life,” he said. Claire Lowe writes Green Piece twice a month for this newspaper. Send ideas or suggestions for stories to claire.lowe@catamaranmedia.com or you can comment on this story by calling 624-8900, ext. 250. The Steelmantown Cemetery is hosting an open house on Saturday and Sunday, Oct. 17 and 18 from 11 a.m. to 4 p.m. The staff will be on hand to answer questions about the cemetery’s history and green burials. Refreshments will be served. Dogs on leashes are welcome. For more information, visit www.steelmantowncemetery.com or call 628-2297.